Interview with Godfrey Reggio and Jon Kane about Visitors. A haunting look at children watching television. High speed film and time-lapse photography combined to create breathtaking images of the night sky and Halley's Comet in this astronomical short subject. "Long Yearning" is a cinematic exploration of the lives of Chinese factory workers and the nature of repetitive industrialized work. There is a wonderful moment at the beginning of this film where the screen is filled with the image of a large cat's eyes staring directly at us (the one from the front of the video box), accompanied by dark, moody chords played by the brass section. It looks away for a second, and then the music swells ominously as it looks at us again. Although I am not particularly "into" the music of Phillip Glass, I must say that Reggio and Glass have produced a really beautiful little film here. My particular favorite is the eerie, other-worldly underwater sequence, featuring black stingrays floating far above us, sea lions swimming as we would imagine mermaids would, inky-black jellyfish, and a swim through a forest of enormous seaweed dancing and undulating gracefully. Glass's music for this sequence is particularly haunting and beautiful -- and if you've ever seen the film "The Truman Show," you've heard this music before. It accompanies a scene where Truman is talking to his best friend, trying to make sense of his life, and the music nicely underscores his sense of unease, sadness and doubt (I believe it was written for "Anima Mundi" first). 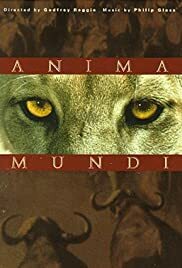 Despite a comment here about "Anima Mundi" being out of print, I did just manage to buy the DVD at a local store here in Chicago, and that edition, at least, seems to be available on-line at Amazon and elsewhere. It lasts just 30 minutes, but it's 30 really outstanding minutes, well worth seeing. The DVD gives a noticeable improvement in clarity and color stability (particularly bright reds) over the now out-of-print laserdisc edition. Get it while you can.